“Our goal with the administration is to show value at the UN and the way that we’ll show value is to show our strength, show our voice, have the backs of our allies and make sure that our allies have our back as well,” Haley said on arriving at UN headquarters in New York to present her credentials to UN Secretary-General Antonio Guterres. “For those that don’t have our back, we’re taking names, we will make points to respond to that accordingly,” Haley warned on Friday. The 45-year old had been serving as South Carolina’s Republican governor for 5 years when Trump picked her for the coveted post. Haley, who was among Time Magazine’s 100 most influential people last year, has vowed to reshape the world body, which was established in 1945 after the end of the WW2. 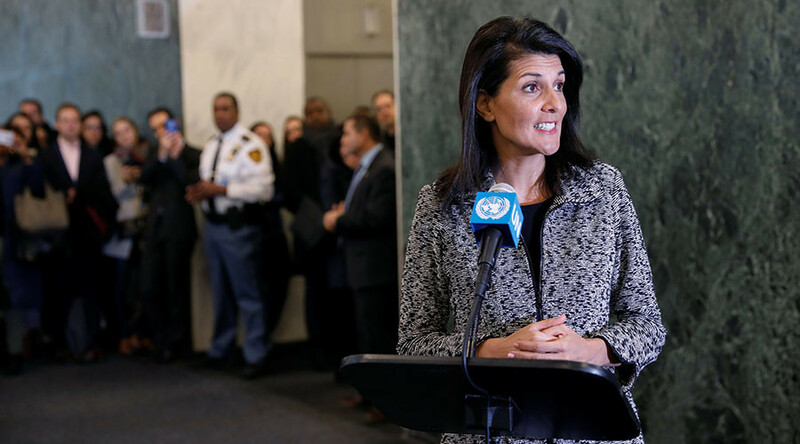 “Everything that’s working, we’re going to make it better, everything that’s not working we’re going to try and fix, and anything that seems to be obsolete and not necessary we’re going to do away with,” Haley told reporters. Haley and Portugal’s ex-Prime Minister, Guterres, had “a good and productive conversation about ways they can work together to reform the UN,” a US official said, as quoted by Reuters. US President Donald Trump is looking for ways to dramatically limit Washington’s role in the United Nations and other international organizations, the New York Times reported on Wednesday, citing two executive draft orders. The new Republican president allegedly plans to order a special committee to review US funding for peacekeeping operations, the International Criminal Court, development aid to countries that “oppose important United States policies,” and the UN Population Fund, which oversees maternal and reproductive health programs, just to name a few issues. Earlier this week, a bill sponsored by Representative Mike Rogers (R-AL) titled the American Sovereignty Restoration Act of 2017 proposed that the United States withdraw its membership from the United Nations. The document seeks a complete US withdrawal from the UN that would include all its agencies and bans Washington from committing funds or troops to UN peacekeeping operations. Rogers and other prominent Republicans have repeatedly voiced the idea that US taxpayer money should not go to an organization that does not promote US interests – especially one that does not stick up for Israel along with the US. Trump lambasted the Obama administration in December for not vetoing a UN resolution that criticizes Israeli settlements, pledging that the United Nations would change under his presidency. “As to the UN, things will be different after Jan. 20th,” he tweeted. America is the largest contributor to the United Nations, paying 22 percent of the $5.4 billion UN’s core budget. “For the regular budget, the US is assessed more than 176 other UN member-states combined. For the peacekeeping budget, the US is assessed more than 185 other UN member-states, combined,” Heritage Foundation scholar Brett Schaefer told the Senate Foreign Relations in 2015. The budget approved for UN Peacekeeping operations for the fiscal year ending in June of 2017 is $7.87 billion, with the US as the top provider of contributions, paying 28.57 percent of the bill. UN agencies, such as the children’s agency UNICEF, the World Food Program, the UN Population Fund, and the UN Development Program are funded voluntarily.